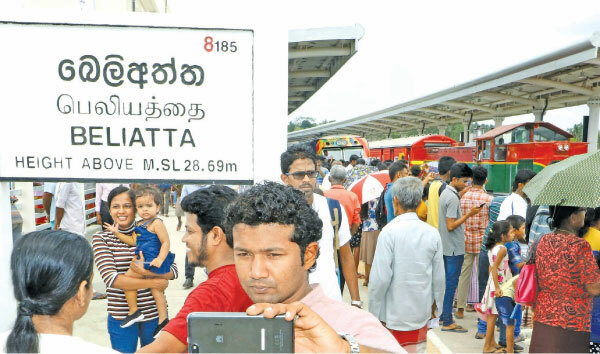 The newly constructed Matara-Beliatta railway line which is considered the first to be constructed in Sri Lanka since 1948 was vested with the public yesterday by Transport and Civil Aviation Minister Arjuna Ranatunga under the project themed ‘Dakunu Lakata Aluth Magak’ (New Road to Southern Sri Lanka). The Matara-Beliatta railway line includes several key features like Sri Lanka's longest railway tunnel, longest railway bridge and the highest and longest railway flyover. Parallel to the opening ceremony of the Matara-Beliatta railway line, new railway stations at Piladuwa, Weherahena, Kekanadura, Bambarenda, Wewrukannala and Beliatta were also be declared open. A special train carrying Finance Minister Mangala Samaraweera, Transport and Civil Aviation Minister Arjuna Ranathunga, Transport and Civil Aviation State Minister Ashoke Abeysinghe, former Transport and Civil Aviation Minister and MP Nimal Siripala De Silva, former Speaker and MP Chamal Rajapksa, MP Mahinda Amaraweera and State Minister of Fisheries and Aquatic Resources Development Dilip Wedaarachchi left the Matara railway station at 8.30 am yesterday with the inaugural ceremony being held at the Beliatta railway station on its arrival. Five Chinese couples were married at the newly opened Beliatta railway station to mark the opening of the Matara-Beliatta railway line. Transport and Civil Aviation Minister Arjuna Ranathunga said the construction work was expedited as per the requests made by both President Maithripala Sirisena and Prime Minister Ranil Wickramasinghe to commission the Matara- Beliatta railway line before the Sinhala and Hindu New Year for the convenience of the people. The new railway line will increase traffic to the south and boost trade between Colombo and the deep south. The Minister further said that his main expectation is to commence work on the second and third stages of the project linking Beliatta to Kataragama via Hambantota as soon as possible to facilitate people travailing from the North and other parts of the country to Kataragama Sacred City. "The President and Prime Minister have also directed me to priorities this task as well. Therefore, the construction work is expected to be commenced once the feasibility study is completed shortly,” Minister Ranathunga added. He further said the longest railway tunnel in Sri Lanka is located on the Matara- Beliatta railwayline. The length of the tunnel located from the Nakuttigama area to the Kakanadura railway station is 615 metres. The flyover from Bambarabda to Vavurukannala is the highest and longest railway flyover in Sri Lanla. The longest bridge of the Sri Lanka Railways which is 1.5 km in length was constructed at Wattegama while the railway bridge built across the Nilwala River is the second longest with 1400 metres in length. It also includes the most modern railway station buildings in the country. The 26.75 km long Matara-Beliatta railway extension was financed by the Exim Bank of China and the contract was awarded to China National Machinery Import and Export Corporation. Transport and Civil Aviation State Minister Ashoke Abeysinghe said a feasibility study on constructing a new 100km-long railway line from Matara to Kataragama was conducted in 1990 and the foundation stone for the project was laid in 1992. In 2005, it was decided that the Southern railway track should be extended up to Beliatta and the Transport Ministry had entered into an agreement with a Chinese company in 2010 to establish this railway line which is 26.75 km in length. Large crowds gathered at the Beliatta railway station to mark this momentous occasion. In 2013, the Finance Ministry signed an agreement for a concessionary loan of USD 278 million with the Export-Import (Exim) Bank of China. He said it was only 23 percent of the construction work completed when the Yahapalna government came into power. Both former Minster and present Minister were committed for the speedy progress of this project. The State Minister further said a rail- bus combined service will commence soon to transport passengers from Beliatta to Kataragama until the rail extension upto Kataragama is completed. Former Speaker and MP Chaml Rajapaksa represented former President Mahinda Rajapaksa on the occasion. We all must work together despite party, religous, race differences to serve the people,” he added. MP Chamal Rajapaksa said the extension of railway line will provide tremendous benefits for the Southern people. He said that he expects to go to Parliament by train once the new Parliamentary sessions commence on May 7. According to the train schedule issued by the Sri Lanka Railways, there would be seven trains on the Matara - Beliatta railway line which will start from the Beliatta Railway station. Four trains will leave for Maradana, one will leave for Galle while other two trains will leave for Jaffna and Vavuniya respectively. In addition, six trains will reach the Beliatta railway station in which five of them from Maradana while one train from Vavuniya. The first class fare from Beliatta to Matara is Rs.120. The second class rate is Rs.70 and the third class rate is Rs. 35. 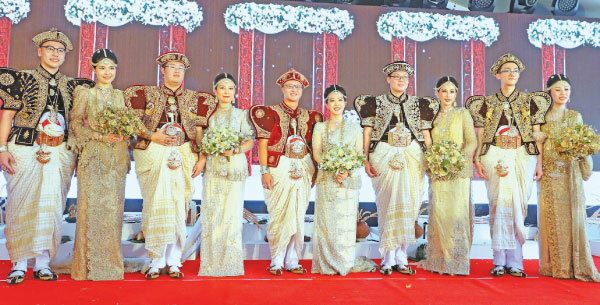 Meanwhile, five Chinese couples were also married at the newly opened Beliatta railway station to mark the opening of the Matara-Beliatta railway line.